Castle, but do not know how to search Scottish church registers, nor find out about tartens. I'm unable to send you my family tree; I'm a novice with this damn machine (PC) and do not know how to send you the required document (in word). However I can tell you that my Great great grandfather was William Duffus who married Ann Stronach (of Drake Meyer-Forgue. Parish of Boham - Morayshire). His father was Rev. William who married Janet Barker. I am interested in finding out more about their anchestors and whether perhaps there is a link with yourself. I hope you have a good trip in October. Regards from Jim Duffus - who's never seen Duffus Castle! only Duffuses in Boharm during the late 1700's and early 1800's. location in reference to Elgin. more you will need to check the cemeteries in Boharm. At last, some details about our family. I have not used a special programe. Let us pray that some of it will make sense !!! We are descended from the Rev. William Duffus of Boharm nr Rothes. He married Jannet Berber. I have searched the Scottish Records but have been unable to confirm which William Duffus he was. William appears to have been a very popular name in the 18th century. I believe that the Rev,s parents may have been Peter Duffus ( C1738 in Boharm ) mother Isabell Dallachie. As you say the only way we shall be able to sort it out is to visit the area looking for gravestones and other local records. Uncle Herbert saw some of these graves when he visited the area in 1954. Herbert says he found the house they lived in. So :- William Duffus m Jannet Berber.Their son William b 1796 in Boharm Co Elgin m Ann Stronach 1829. They were our great great grandparents. They had 7 children Margaret b 1831, James b1834, William b1836, Anne b 1839 Janet b 1841, George b 1844, Alexander b 1846. Now Jim and I have worked out all their descendents but I shall have to send that to you another way , its too clumsy by E-mail. Jim and his family are descended from William Duffus ( 3rd child b in 1846 ). George born in 1844 is my great grandfather. George trained as an engineer in Glasgow. He travelled to Jamaica about 1870 to look for a cousin who was a plantation owner. Unfortunately the cousin was drowned with his wife and 3 children while escaping from the Morant Bay Rebellion in 1865. They are buried in Bath churchyard, St Thomas in the Eastern end of the island. There is no doubt that a Duffus did have a plantation and was a slave owner in the late 1700's and the early part of the 19th century. I have not been able to find a definate connection to our branch. To do this we need to visit Jamaica to search the records. It is of interest to note that the drowned cousin was married 3 times. My uncle thinks that one of the children from the first marriage went to New Zealand as a young man. As a very small boy Uncle Herbert was taken to meet a grandson of the drowned person who was on holiday in Jamaica, He was a Catholic priest in Barbados. All Herbert remembers is that he had a very red beard !! Although George did not have any luck with meeting up with relatives, he did fall in love and in 1872 married Elizabeth Ramson. They had only one child my grandfather b 1875 William Alexander d 1963. Many of the letters from George to Elizabeth have survived . He always ended them saying " I am yours till the end of time " George was kept very busy working as an engineer. They were able to settle on a property near Montago Bay. He always kept in touch with his family in Scotland, some of their letters have also survived,he died in 1915. My grandfather was a Civil Servant, most of his life being spent working for the Legal Dept. He married Emily Holwell in 1907 in Kingston. They had 3 children. Herbert b 1808, William 1911 and John Jack ) in 1921. All 3 boys trained as lawyers. Both Herbert and William had distinguished careers in the Colonial Legal Service. Herbert married Elsie Hollinsed in 1939, they do not have any children. Jack is unmarried. He still practices as a lawyer in the Bahamas where he has lived for the last 30 years. William married Helen Hollinsed in 1938 ( Elsie's younger sister !! ). They had 3 children all born in Jamaica. Diana b 1940, Philip b 1943 and John b 1945. Sadly William died in 1981. At his death he was still on the Court of Appeal for Bermuda, The Bahamas and Belize. William and his family left Jamaica in 1948, he for further legal training in London prior to taking up a new appointment in Nigeria. The children to start school !! They bought a house in Cambridgeshire for their holidays making England their home. In the future Jamaica was visited only for the long summer leaves. Diana trained as a Nurse/ Midwife having a most interesting career delivering over 500 babies. !! Sadly she had to take early retirement last year as a result of an accident, m Jack Le Brecht in 1971, one son Henry b 1977. Philip always wanted to be a Veterinary surgeon. He m. Beryl Horgarth in 1969. They have 2 daughters Julie b 1975 and Phillip b.1985. John trained in Hotel Management. He m Judith Mead in 1969. They have 2 children Nicola b 1972 Benjamin b 1974. John and family have lived in Toronto since 1977. I hope that the above will be of some interest, there is still much to dicover, the early Duffus's in Jamaica and their connection to our branch plus the early history in Scotland. I am also sending 2 photos 1 of George Duffus the other a recent picture of my aunt and uncle in Jamaica plus Philip's CV for the Academic section. Health allowing I hope to visit Jamaica early next year to visit with my uncle and have a look for early Duffi. The second E-mail may take a little time to down load. They are compressed as JPEG's. George Duffus in 1870. And a recent photo of Uncle Herbert and Aunt Elsie. Subject: More Photos from Diana. in 1905 in Jamaica. William Duffus marrying Emily Holwell. 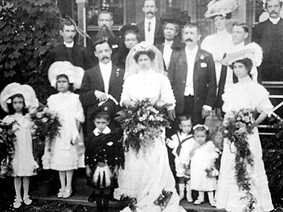 The bearded man behind the groom is William's father George, his wife is standing beside him. 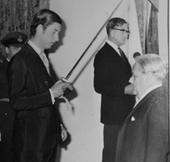 Also enclosed is Prince Charles knighting my father William in 1970. Pa was the first person Prince Charles ever dubbed !! 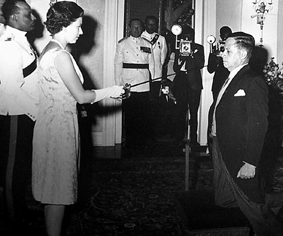 To follow The Queen knighting Uncle Herbert. Apologies, Great grandfather was born in Forgue not Folgie. Philip says please take out what you want from his CV. He says its very long - winded. Finally please note It should be 500 babies delivered not 5000 !!! Woe Typing error. are you still intending to visit the UK in the Autumn ? Philip, Jim and I would love to meet up with Dianne and yourself. by the Queen at Government House in Kingston. The second is of Philip & his family taken on Graduation Day at Bristol University 1997. Hope you got the rest of my messages.